If you are a bird nerd who lives within a 50 mile radius of Ridgefield, Washington, the Ridgefield National Wildlife Refuge is a must-see spot. (A few days each year, it’s even free to visit!) A birder friend of ours was shocked we’d never been there and encouraged us to go. We thought it would be a great way to spend a sunny afternoon. We spent our entire afternoon there, from about noon until just before the gates locked at 5:00 PM. It was birdnerdvana! The refuge has a few different units; we spent all our time in Unit S, a 4.2 mile driving loop through the wetlands. No one is allowed out of their cars on the loop to maintain the best protection for the animals — except at one spot where they’ve built a photo blind. There are wetlands and fields (there are more fields or more wetlands depending on the time of year you visit) on both sides of the road, and visitors are really quite close to the wildlife. We would recommend bringing binoculars, however, for the best experience. We were able to identify 18 species of birds, but without our binoculars, we’d have had a much more difficult time identifying birds. We also used our iBird app on our phone and our Sibley Guide to Birds to help us identify the birds. We had previously seen 16 of those, but we added two new species to our life list there: the Rough-legged Hawk and the Hooded Merganser (we saw both a male and a female hiding out under some trees). We are very excited that our life list now has over 500 species! We saw many water birds and raptors on this trip, but we also saw some mammals. We saw six raccoons foraging on a riverbank. We’re not sure what they were digging around for, or what they were doing out in broad daylight, but they were busy! 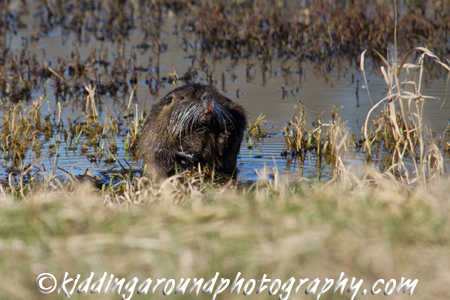 We also saw a gigantic nutria or river otter. We’re not exactly sure how to tell them apart. It wasn’t in a river, and it was up out of the water for a long time, so we think it was probably a nutria, but it was the biggest one we’ve ever seen. It was about the size of a beaver! We actually were hoping it was a beaver, but the tail was definitely not a beaver tail. It was pretty cute, actually. Erin took a lot of photos at the refuge, and several are posted in this entry, but if you are planning to photograph birds, don’t expect them all to look like these. You are only seeing her favorites here, not the hundreds that didn’t turn out. (She photographed these birds with a Canon 7D and a 400mm lens.) She took over 100 photos of the egret you see reflected below, and of those, she was really happy with only two. 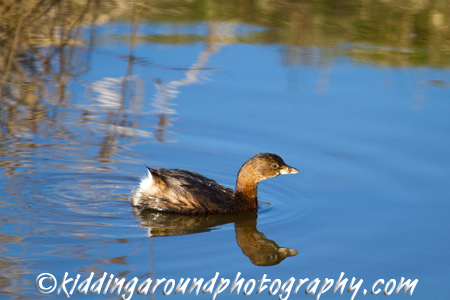 The photo of the Pied-billed Grebe, at the beginning of the post, however, was one of only three shots she took of those birds, so you never know. The key to good animal photos is getting the eyes sharp (see the hawk photo). Your car is your blind! Mystery hawk staring at us! River S unit, a 4.2 mile driving loop through the wetlands. Jeff scoping out the birds. Gadwalls swimming in a side channel. One way bridge into the refuge. Great Blue Heron in the sunlight. What’s your favorite birdnerding spot? We’re always on the lookout for a new adventure, so let us know where we should explore. Enjoy your week or your weekend! Thanks for checking it out! We’ll give yours a look, too. Enjoy your week or your weekend! I love finding fellow bird nerds! I got hooked on birding in Costa Rica and came back home to discover a great birding area in Southeast Virginia. Happy Birding! Birding in CR is incredible! We’re in Phoenix this week – spotted a Gilded Flicker today. Beautiful bird! Enjoy your week or your weekend.